Seen at the Bay in Metrotown. Forgetting Kwanzaa is about the same as forgetting Festivus. 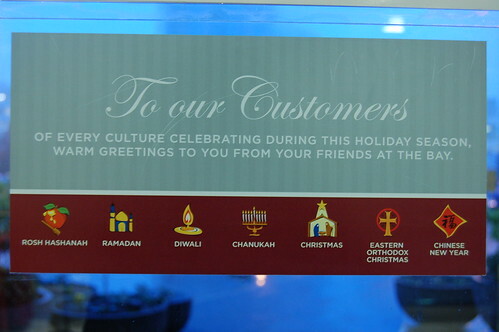 Wait, while I’m at it, what the heck is with splitting out "Eastern Orthodox Christmas" from "Christmas"?!?! I suppose they were trying to fumble around for something like "we know you guys give gifts on January 6th or whatever, so happy special late-Christmas, eh?" Similarly but in reverse, they don’t have New Year’s Day, but they felt a need to appeal to the Chinese population by adding Chinese New Year. Not being Chinese I could be wrong, but I believe Chinese New Years’ is a gift giving time whereas ours isn’t. Thus it’s more likely that Chinese New Years’ gifts will be bought at the Bay than western New Years’. Seems that the Bay was really stretching for holidays here. With Rosh Hashanah was back in September; the Chinese New Year was a week ago. While I appreciate the attempt to be inclusive of various religions’ and cultures’ new years and winter holidays, this might be going a little over board. When we say "seasons greetings," we’re generally referring to a period in December/January lasting a few weeks at most. Not 5 months!